More changes are in the air, just as the brisk winds blow away the dreariness of winter here in middle Georgia. My husband is undergoing surgery and the attendant stress ratchets up the anxiety. The anti-dote is needlework. Anything busy and engaging. So what am I taking with me to face the challenge; a bag full of knitting and cross-stitch. I have down-loaded another DMC pattern and have everything to start a simple pattern with one color of DMC variable colored cotton. In addition, I have several knitting projects. A Wendy Johnson Mystery Lace Knit Along from a couple of years ago that I started and have since frogged to try it another day. Maybe this will be the time. I have been waiting for some yarn cozies to hold the yarn for a Fair Isle cowl from the last Vogue Knitting magazine. I think I will just put them in some sandwich bags instead, the pattern is so beautiful I want to start it. And then there are the ubiquitous dishcloths to knit to while away the hours of waiting. This week we have been busy preparing for the long recovery period necessitated by the surgery by prepping for some work to our house in the weeks following DH’s surgery as he will not be able to help me. We are going to make some major changes in where the sewing studio and the guest room are. I came home Friday from running errands and the bonus room was emptied, the closets were painted, and all the living spaces were filled with boxes from the bonus room. Chaos reigns! 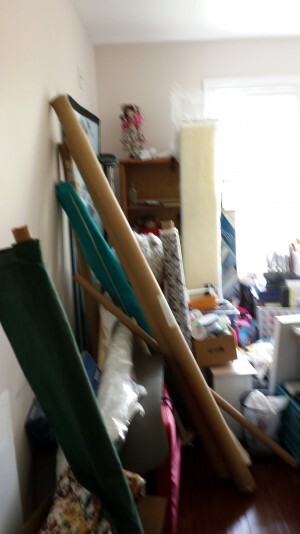 Current Sewing Studio buried in boxes. I am excited about the new storage possibilities but not the ensuing chaos as we wait for the end product. It isn’t easy to walk around in some areas currently. I wanted to keep up with my blog even during this challenging time, needle on. This entry was posted in Uncategorized and tagged changes, Cross Stitch, knitting. Bookmark the permalink. Hello there – I can relate with the changes that keep coming. And trying to keep rolling with them. Hope all is well.